The new Promega Water-Glo™ System offers a highly sensitive and flexible measurement tool for monitoring microbial contamination in freshwater, process water, seawater or wastewater samples using bioluminescent technology to measure adenosine triphosphate (ATP). Even the slightest change in ATP levels acts as an early warning system to quickly assess the presence of live microbes and possible dangerous pathogens in water. MADISON, Wis.--(BUSINESS WIRE)--Promega Corporation’s new Water-Glo™ System offers water plant operators a rapid, highly sensitive and flexible measurement tool for monitoring microbial contamination in freshwater, process water, seawater or wastewater samples. The Water-Glo™ System, launched by Promega this week, uses bioluminescent technology to measure adenosine triphosphate or ATP, the "energy currency" of all living cells that degrades rapidly when a cell dies. Even the slightest change in ATP levels acts as an early warning system to assess the presence of live microbes and possible dangerous pathogens in water. To learn more, visit Promega.com/ProtectYourProcess. 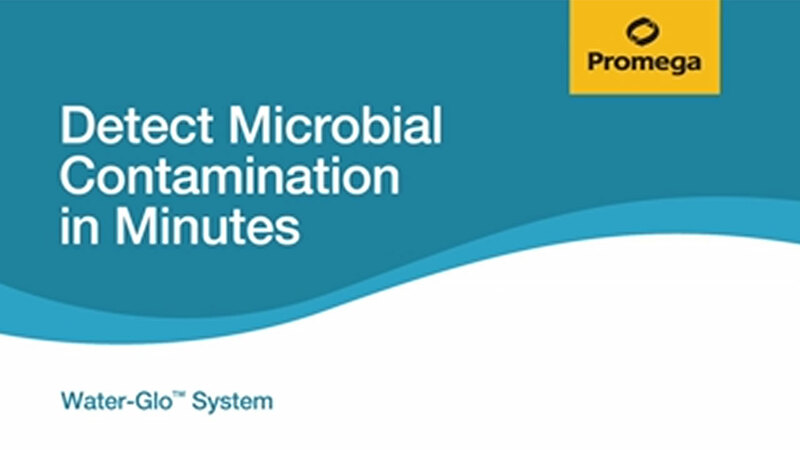 The new Promega Water-Glo™ System uses ATP detection to quickly assess microbial contamination in freshwater, process water, seawater or wastewater.